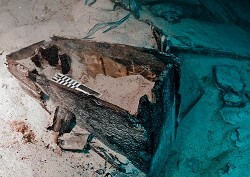 THURSDAY, JUNE 23: A secret stash of wine bottles discovered on the shipwreck the Mary-Celestia marks a new chapter in the story of this well-documented Civil War blockade-runner. A team of international marine archaeologists and Government’s Conservation Services, made the discovery of five full wine bottles last week during a high-profile excavation. They found the bottles stashed in a crumbling wooden crate in the bow of the ship, separate from the main cargo that has long been excavated. The mini haul adds weight to the theory that the blockade-runner, which sunk under mysterious circumstances in 1864, was carrying contraband or that the bosun had stowed away a personal stash of goods there. Custodian of Historic Wrecks Dr Phillip Max Rouja explained that finding the bottles was merely the start of the discovery. Asked what the next stage of the project entailed he joked: “We have a drink and celebrate but not from them,” pointing to the bottles. “I can’t imagine feeling anymore brilliant than I do now but if we can find a maker’s name that is even better. The Mary-Celestia is a wreck with historical significance to the United Kingdom, where she was built, Bermuda, where she operated out of and where she wrecked and the United States, where she ran to as a blockade-runner during the US Civil War. The excavation also yielded the remains of leather shoes, rope, a hairbrush and the wooden form for a shoe among other items. Dr Delgado is loath to make any conclusions at his early stage of discovery. The expedition has been filmed by LookBermuda and will be made available through schools, LookBermuda channel one and possibly major US networks including National Geographic or PBS. LookBermuda’s director J-P Rouja told us that this film was the TV production company’s most ambitious project to date. For more information visit: www.Mary-Celestia.com and www.lookbermuda.com.